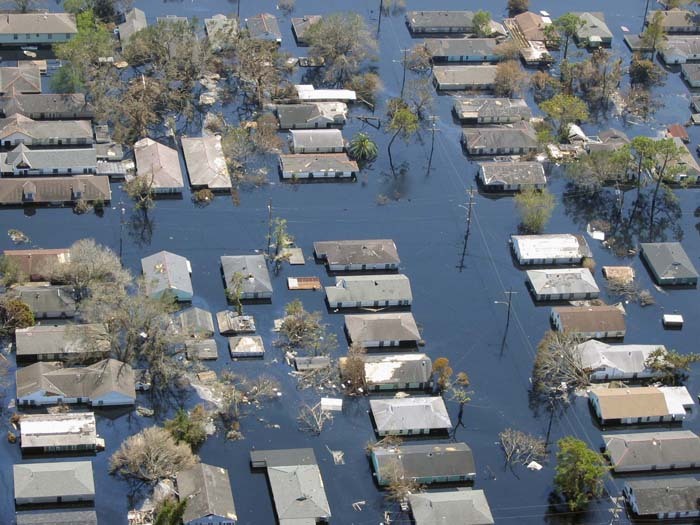 The levee failures following Katrina inundated more than half the city. An analysis of more than a decade of population data shows a state that is simultaneously thriving and withering, clearing hurdles and tripping over itself. The data support some narratives about the recovery after Hurricane Katrina and challenge others, including those from the Jindal administration. For instance, while it’s true that New Orleans has experienced some of the greatest growth in the country in recent years, according to some measures that growth is slowing. And at the current rate of migration, it would take Orleans Parish 20 years to return to its pre-Katrina population — 15 if you factor in the birth rate. Moreover, the most recent figures show that growth in New Orleans is masking a population loss in the rest of the state. The most recent year for which data is available shows that the state lost population domestically for the second straight year. That loss is outweighed by the number of international immigrants, however, resulting in a net migration into Louisiana. A total of 236,970 people left Louisiana between July 2005 and June 2006, largely due to Hurricane Katrina. The state has recovered about 100,000 people since then, according to population estimates by the U.S. Census Bureau and migration estimates by the Internal Revenue Service. Every year since Katrina, the state has gained more residents than it has lost. But with the exception of 2009, each year the increase has been smaller than the year before. The most recent data, for 2012-13, showed that 4,203 more people moved into the state than out of it. At that rate, it will take Louisiana about 33 years to recover the migration loss due to Katrina. Many of the first people to return after Katrina were able to do so because they still had jobs, said Allison Plyer, executive director of the Greater New Orleans Community Data Center. Others, even if their homes were relatively undamaged, couldn’t return because they lost theirs. The lack of jobs is the simplest reason why New Orleans and the surrounding areas have not fully recovered their pre-Katrina populations, Plyer said. “Population growth always correlates strongly, at the metro level, with job growth,” Plyer said. The tourism industry lost the most jobs as a result of the storm, according to the Greater New Orleans Community Data Center’s “New Orleans Index at Eight.” Higher-education jobs mostly have been replaced, while other industries, such as oil, gas and shipping, have mostly continued their long-term losses. If Orleans, Jefferson and St. Bernard parishes were excluded, the state would have lost people every year except 2009. That was a high point in the return because that’s when much of the infrastructure, schools and jobs were back, said Ray Brady, applied computing lecturer at Tulane University. It is difficult to say who exactly has moved to the greater New Orleans area to take these jobs, but a study suggests they’re mostly returnees. This challenges anecdotal evidence about New Orleans being a mecca for young people, particularly in film, tech and education. Data from the U.S. Census Bureau’s American Community Survey suggest that the majority of the people who have moved to Louisiana in the years since Katrina are returnees, said demographer Elliott Stonecipher of Shreveport. Migrants are coming from the same places that people relocated to, such as Texas and Georgia. Demographics in New Orleans have also changed. The city now has a smaller share of African American citizens, and a greater share of white, Hispanic and Asian citizens, according to the Greater New Orleans Community Data Center. The state’s population has increased every year since Katrina, but the rate of growth has generally decreased — and it’s among the worst of southern states. Predicting the state’s future population growth is “tenuous,” said Plyer, because it depends heavily on the job market. The state’s economic outlook looks good now due to the petrochemical and natural gas industries, she said. These two industries will be part of 42,000 new job openings in southeast Louisiana in the next six years, according to a January study by the Greater New Orleans Community Data Center. The petrochemical industry appears to be the only way to encourage people to move to Louisiana, Stonecipher said. Before Katrina, the state’s population largely grew because of births, not people moving to Louisiana. If births can’t keep pace with the number of people who move out of the state, it could result in “a collapse in population,” Stonecipher said. In 2012-13, the most recent year for which there are Census figures, Louisiana had a net gain of 4,200 people who moved from elsewhere. But that happened only because the number of people who came from other countries outweighed the 2,500 who moved to other states. The same thing happened the year before. Stonecipher said the state is returning to the trend before Katrina, when more people moved out of Louisiana than moved in. Before Katrina, the state continually lost people to other states — an average of about 17,000 people per year since 2000. Complicating the matter is the unreliability of international migration figures, Stonecipher said. “I still don’t have any confidence in the foreign migration stat … and frankly, I don’t know anybody who does,” he said. The U.S. Census Bureau recently redefined international migration to include members of the U.S. military returning from abroad. The bureau also uses Department of Homeland Security data, which can include undocumented workers who are temporarily here working on recovery projects. Neither of these reflect true changes in one’s residence like domestic migration data, which are based on annual income tax returns. Despite near-constant migration loss over the past several decades, Louisiana has slowly gained population because births outnumber deaths every year. That margin is decreasing, however. Louisiana’s current birth-to-death ratio is approximately 1.5 births to every death, slightly lower than the U.S. average. In 1980, which Stonecipher uses as a baseline reference, the ratio was 2.2. Even as the birth rate helped increase population in Louisiana, the growth was small, Stonecipher said. Loss of congressional seat: Due to Katrina or inevitable? Louisiana lost one of its seven seats in the U.S. House of Representatives following the 2010 Census. It was the only southern state to lose a seat in the reallocation that happens every 10 years. Some people blamed Hurricane Katrina. Demographer Greg Rigamer said this would have happened regardless. Louisiana lost population from 2000 to 2001. And during decade overall, its growth was outpaced by other states, especially in the South.